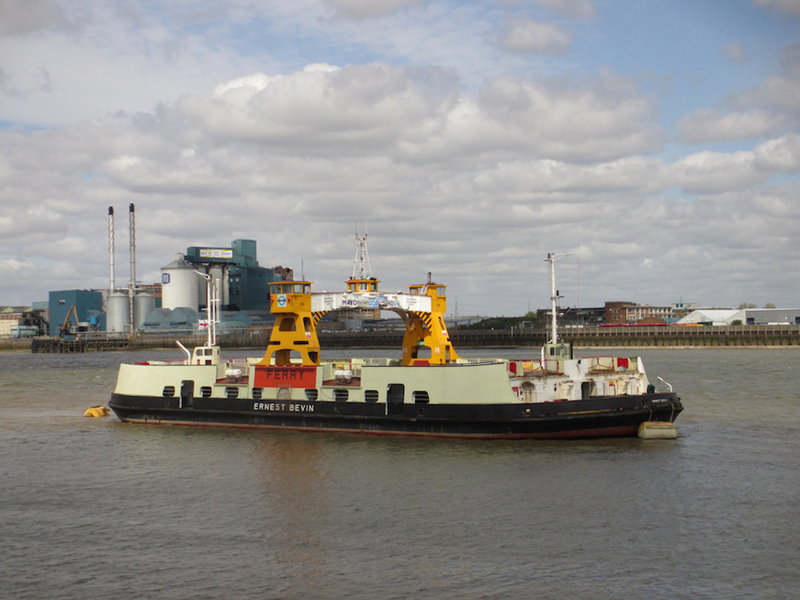 Should We Save The Free Woolwich Ferry? M@ Should We Save The Free Woolwich Ferry? The good ship Ernest Bevin takes a rest. Image by the author. In one of the world's most expensive cities, it's gratifying to know that you can still take a Thames boat trip without paying a penny. The Woolwich ferry carries hundreds of cars, trucks, cyclists and pedestrians over the river every day. Some kind of ferry service has operated here since medieval times. But the days of the Woolwich ferry could be numbered. Momentum is growing for a new river crossing in east London to relieve pressure on the Blackwall and Dartford crossings. A new bridge or tunnel (for which public consultation is currently open) would provide much greater capacity than the veteran ferries currently in service. Some in Greenwich Council and Transport for London would prefer to see the boat service withdrawn if the new crossing goes ahead. Such a move would save TfL millions in annual running costs. It would also dodge the bill for upgrading or replacing the ageing fleet. Even if a new bridge or tunnel are built as proposed by TfL, congestion is only going to increase year-on-year in east London. This means that the Woolwich ferry does not stop being relevant or strategically important, both as a crossing in its own right or as an additional means of easing congestion when a single car or lorry (inevitably and regularly) breaks down in the existing tunnel (or on a new bridge) and brings this part of the capital to gridlock. If east London actually needs additional crossing capacity, why dispense with this vital piece of existing infrastructure? Closure of the Woolwich ferry would not only have repercussions on local traffic congestion, it would also mark the end of a piece of Woolwich history. The ferry has operated a free service since an Act of Parliament in 1889, and no tolls can be imposed without Parliamentary consent. Earlier ferries have covered this stretch since at least 1308, and possibly since the time of the Conqueror. But if we put nostalgia aside, is there really a strong case for keeping the ferries once a new bridge is in place? Keeping the extra capacity the boats offer is obviously a plus point, but it has to be weighed up against the cost of running the 50-year-old infrastructure (£50 million over seven years the last time the contract was awarded). There are clearly pros and cons to keeping the ferries, and keeping them free to use. We'd be interested to hear the views of readers who regularly use the service, or who have concerns about their potential withdrawal. In the meantime, sign the petition if you agree that the free ferries should be saved.